A histogram is a lightroom tool that enables the user to understand the shadows, highlights, and other tones of the photos. These are reflected in the form of a graph where the user can determine the contrast and exposure. The changes in the histogram are seen as we move the sliders in the Basic panel. This feature becomes particularly useful as we send photos for the printing process. The histogram appears in the Library and Develop modules in the top right-hand panels. In the Library module, you can view the changes in your image as you make the adjustments in the Quick Develop Panel. In the Develop module, you can view how the adjustments in the post-processing impact the histogram. Clipping is indicated by two triangles at the top corners which indicate the Show Shadow clipping and Show Highlight Clipping. Use the keyboard shortcut J key to show and hide the clipping. In the histogram above, the Show clipping is colored in white, indicating the image has clipped shadows. 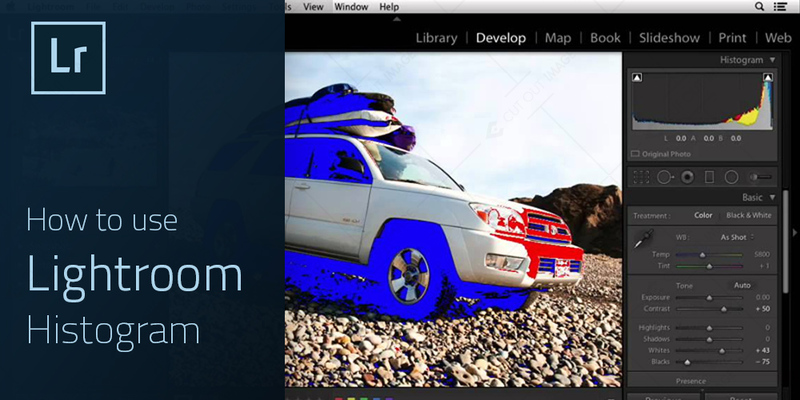 When we hover over the Show Shadow clipping icon, those areas are highlighted in blue in the image( as shown below). The show highlight clipping icon is gray in color. This indicates that there are no highlighting areas in the picture. This is a good sign for professional photographers. These Clipping icons are useful to ascertain whether the user is losing highlights and shadows by making adjustments in the Basic Panel. Let’s take an example. Once I set the exposure to +1.00 for this image, the indicates that the detailing in the sky is lost. The show Highlight icon appears white to reflect this change. On clicking the triangular icon, the areas are highlighted in red. This also means that I have set the exposure at a very high level. Again if I reset the Highlights to -100, the detail shows that there is no longer any highlight present. We can see the changes in the histogram below. Apart from clipping, we can use the histogram to analyze and adjust the contrast of an image. When all pixels are piled in a single area in the histogram graph, it indicates a low amount of contrast. If all the data is concentrated in the middle, the image has mid-tones. When data shifts to the right, it means that the images have only bright areas and nothing is dark. If the data is towards the left, then the image ids dark and nothing is bright. The above image shows minimal contrast. This image has a large amount of contrast. We can increase the contrast by maximizing the contrast setting in the Basic panel. We can also look at the highlights and shadows of an image with poor contrast and move them towards the end of the graph. The histogram is very useful in processing images in Lightroom. The Exposure, Highlights, Shadows, Blacks and White sliders in the basic panel indicate the zones in the image. You can identify the clipped areas and the areas with contrast, and solve the problems with the lightroom tools.